Fortnite Bouncy Castle available to hire for customers throughout Boston, Donington, Sleaford, Holbeach, Spalding, Coningsby, Tattershall, Old Leake, Bicker, Swineshead, Horncastle, Rivesby, Woodhall Spa and all surrounding areas. 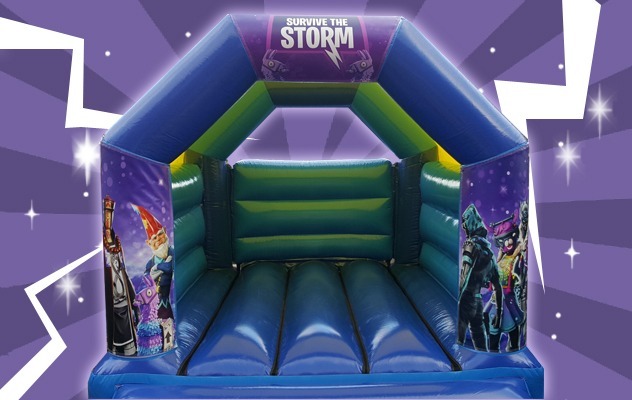 Here at Laken Inflatables, we are now available to offer a fantastic Fortnite inspired bouncy castle suitable for children up the ages of 12 years old. Now you can have your very own Battle Royale Party. With is super shiny high gloss material and sun/rain cover this is a real hit with all those Fortnite Fans. Fortnite just seems to be on every kid's mind at the moment, if their not playing it then they are doing the dance moves and flossing round the living room, they want the latest toy figures clothing and anything else you can think of, now you can make their day with this EPIC Fortnite castle! This was designed here at Laken Inflatables and a lot of time has been taken to get it just right with a lot of criticism from two big fortnight fans to get it perfect. 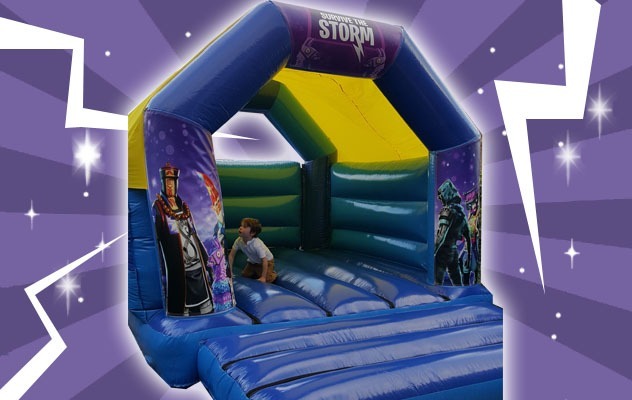 This castle is ideal for Birthday Parties, Get-togethers and Family parties, ideal for hall hires and garden parties, with its brightly coloured artwork and gloss fabric it's a real show stopper! We have additional product available to hire alongside this castle, why not add on Didi cars which are always a real hit at parties (8 Available to hire) or our Nerf Shooter to really get in the battle mode. This castle features the most loved Llama Pinatas, DJ Bop the cool techno DJ, Grimbles the cute little gnome Insight a rare Fortnite Outfit from the Ranged Recon set and Paradox is an Epic Skin from the Ouroboros set along with other fantastic "Epic" character skins. Please note that you are only charged for the castle the velcro is provided free of charge.